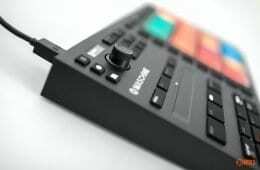 Years ago, I was inspired by Vestax’s QFO to come up with the concept of the Faderbox. With Elliot at Audio Innovate, the design was evolved into something pretty damned cool, but sadly a lack of funds meant that it went nowhere. But clearly, I’m not the only one with grand ideas of making a deck into an all in one. KODH is a French DJ who wanted something rather more portable than 2 turntables and a mixer gaffer taped together and lugged around on a trolley. So he set about working on the idea of merging a mixer and a digital deck together to make a cool all-in-one performance piece – called SCRxTCH. But don’t ask me how to pronounce that in English or French for that matter. This is quite an adventurous task that sees a Vestax PMC mixers and a Denon DN-S3700 torn apart and surgically attached to each other. Well it’s more of a near full implant as this is quite a bit more than just adding a fader to a CD deck. The SCRxTCH is a never seen before portable instrument that offers a user to perform manipulations of sound, such as “Scratch”, “filtering”, “glitching”or “Dj-tricks” and allows a greater range of movement compared to conventional turntables and mixer. I used different elements from the pmc 05 and 06 pro Vestax, Denon dns 3700. I used a couple of hand-made circuits- i reprogrammed some part of the Os. The most important thing was the weight. 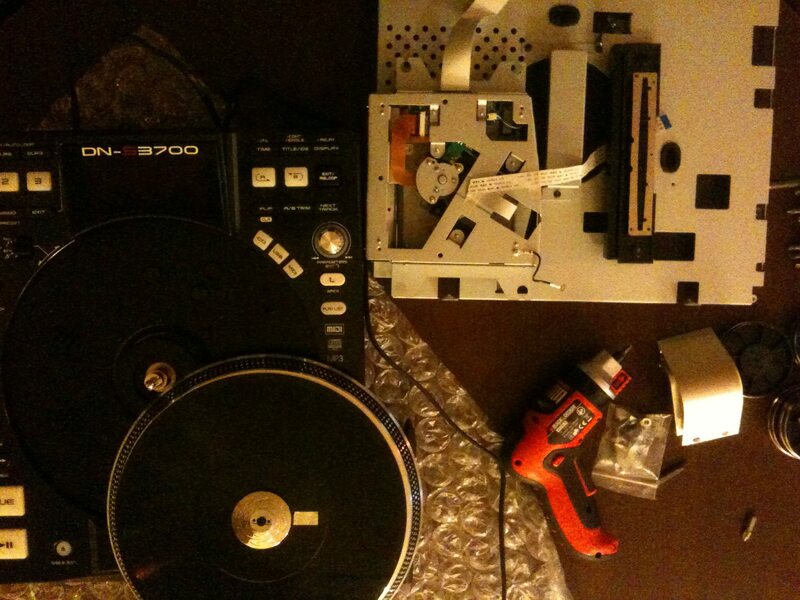 i had to removed a lot of the parts in the audio player and the mixers. The device weighs 4,6 kg like a bass which is pretty cool as you carry it. Having something new for the stage and something creative original fresh.. I wanted to open the possibilities of expressions a dj can have; like the guitar heroes, who are link to their instruments. I was also thinking about the audience – they are often frustrated not seeing what we are doing – with this device they can understand better. It was also a personal step to move the boundaries of the turntablism. You don’t see a lot of Dj’s creating gears themselves. I simply try to animate and stimulate avant-garde of electronic music in parallel of my band Voice Hands Machine. 3 or 4 electrochocs that shown me some electric problems…ouch! As the pmc 06 is a discontinued product, i had to find one in the used market but it was a trap to steal me money. 1cm from being cut when i was drilling some of the device parts. I’m sure I don’t need to say this, but this is strictly a one-off prototype. But it does make me wonder if such a device could go mainstream. Again, it keeps bringing me back to how a small but very portable scratch device could do really well out there. Numark’s iDJ Live driven by an iPhone shows that it can be done. Hats off to Kodh – he dreamed about it and did it. I applaud people like him.